Cure Your ALE-ments: Hoppy International Beer Day! It is patio season! There is no better way to enjoy it than by having an amazing meal topped off with an even more amazing ice cold beer. Today, August 3rd, is International Beer Day. Beer is one of the oldest and most popular alcoholic beverages. With plenty of varieties of beer, one can surely find one that suits their taste. The basic ingredients to make beer are hops, water, yeast, and grains. Wheat, rye, oats, millet, sorghum, rice, and corn can all be used for brewing beer. However, barley is the most preferred grain. There are three different types of brewing methods. One method is extract brewing, which uses malt extracts. This will form the base of the beer, which is called wort. This method requires less equipment, space, and time, which is preferred for those that would like to try home brewing. Partial mash or “mini-mash” is another brewing method. This uses malt extract as well as other specialty grains. By doing this, the profile of the wort changes, which increases the likelihood of creating flavor and body to the beer. All-grain brewing is the purest form of brewing. It does not use malt extract, meaning all the sugar is extracted from the grains. This method of brewing requires more equipment and space which may not be desirable for first-time brewers. The brewing process has three steps. The first step is the mash, the process of activating the enzymes found in the grain. The enzymes break down starches into sugars providing food for the yeast. To do this, the grains are immersed in hot water. This process creates the base, color, and overall taste of the beer. Lautering is the second step. In this process, the wort is separated from the grain and the sugar is removed from the grain. The last step of the brewing process is the boil. The purpose of boiling is to destroy any unwanted enzymes and remove harmful oxygen. It also lowers the pH, which stabilizes the wort. Hops, which are green cone-shaped flowers, are added during the boiling process. It provides bitterness and additional flavor to the beer. After boiling, the brew is then cooled down. In this process, brewing yeast is added either as a liquid or dry form. After the yeast is added, it is left to ferment. This process is the most important step because, at this stage, the yeast converts sugar into ethyl alcohol and carbon dioxide. Additional hops are infused during the secondary fermentation to provide extra aroma to the beer. This is called dry hopping. It is traditionally used for beers like pale ales and IPA’s but more styles of beers are incorporating this technique. After the fermentation process is over, it is important to store the beer in an airtight vessel, allowing for carbonation. One can choose bottling, which is the simplest method or kegging, which is a quicker process. With the right equipment and knowledge, anyone can start brewing their own beer right at home. Going through the beer section of the liquor store, one is faced with plenty of varieties of beer. The two basic types of beer are lager and ale. 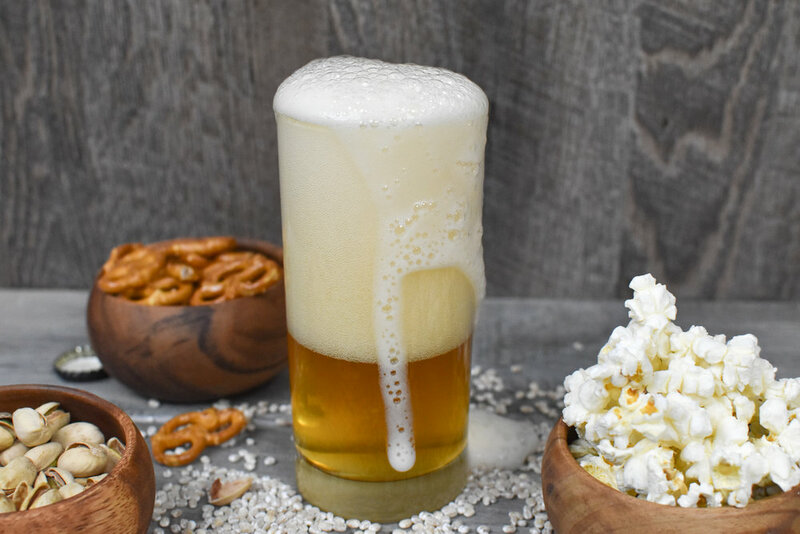 Lager, which is the most popular type of beer, originates from the German word lagern meaning “to store.” It is created from the bottom fermentation, meaning that fermentation occurs at the bottom of the container under cooler temperature. Lager beers are known for their crips and clean flavor. Pilsner, originating from the Czech Republic, is one of the most popular types of lager. It is known for its pale, gold color and crisp flavor. Other types of lager are the American amber, bock, and the American pale lager. Unlike the lager beers, the ale is created from top fermentation under warmer temperature. Ale beers are known for their fruity, acidic, and pleasantly bitter taste. India pale ale, also known as IPA, is a type of ale and is one of the most popular craft beers. It has an herbal, citrus, or fruity flavor. Porter and stouts are also types of ales. These ales are known for their dark, almost black, color and sweet, chocolate taste. Other types of ale beers include pale ale, Belgian ale, and brown ale. Since it is International Beer Day, why not be adventurous? Try a beer that you have never tasted before. You never know, you might find a new favorite. It can be easy to lose track of how many beers you are drinking considering today is International Beer Day. Try to be mindful as beers have calories. In fact, one can of beer (356 g) contains about 153 calories. Those that need to watch their carbohydrate intake also need to control how much beer to drink. We know that beer is made from grains which is part of the carbohydrate food group. One can of beer contains an average 13 grams of carbohydrates. Beers also contain other nutrients such as protein, potassium, and sodium but only in small amounts. So if you drink more than one beer, the calories and carbohydrates do add up. You may also visit Efficient Drinker to find out more about beers, their alcohol content, and how many calories are in 12 ounces. Today is the day to celebrate and appreciate the art of beer, along with the fact that it is Aloha Friday. Enjoy a glass of beer with friends and family. Just remember to be mindful and always drink, responsibly. Cheers everyone!